It's challenging to control various servos to mimic human walking. All servos have different angles and frame of references. Unstable Network. We remote control raspberry pi via VNC and the network occasionally dropped. Materials: Flying from the Colorado School of Mines, we were not able to bring much power tools and hardware materials (prohibited by TSA on plane). However, with some creative thinking, we utilized all available resources. 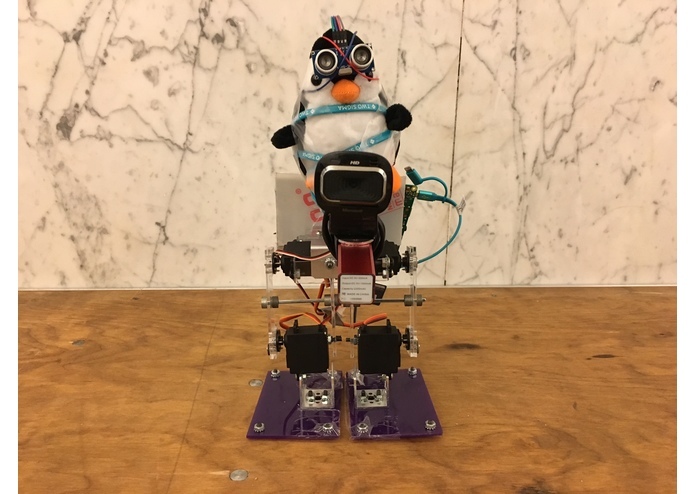 A penguin robot that can walk like human, detect obstacle using ultrasonic sensors, and detect human faces using webcam+OpenCV. Designed and Built a working robot with few materials and power tools. Engineer by Day, Tinkerer by Night! I enjoy wearing multiple hats and thinking about problems in multiple perspectives! Inspired by PennApps spirit animal Penguin!